In the previous chapters you generated viewers using XEO Studio's Scaffolding tool and went through an explanation of the basics of XEO Viewers as well as customized an edit viewer for the LIB_Book Object Model. In this chapter we'll introduce the Java API to use when creating your own custom viewers and beans, before that, however, you should create some instances of Object Models so that some of things you'll do in this chapter are visible. And create a publisher with any name you like (Wrox Press, for example). Now add two book instances (for example book Beginning Spring Framework 2 and Professional Apache Tomcat 6), for the author you can use the previously created "John Doe" (or create a new one) and for the publisher use the newly created "Wrox Press" instance. The task in this section is to add a new tab to the LIB_Publisher and LIB_Author edit viewers, to display the list of each books that publisher/author has worked on. This will also be used to introduce the Java API that can be used. Start by creating a new Java class in the org.examples.viewer.beans package with the name LibPublisherEditBean and make it extend the netgest.bo.xwc.xeo.beans.XEOEditBean class, then open the LIB_Publisher/edit.xvw file and change the classBean property to org.viewers.examples.viewers.beans.LibPublisherEditBean this will associate the viewer with this bean. The getXEOObject() method is available in the XEOEditBean and returns the current boObject instance being edited (in this situation, the publisher instance); since relations between instances are done using the instance's BOUI (Business Object Unique Identifier), you use the getBoui() method to complete the query. If the BOUI of the current publisher is 12345, the query would be select LIB_Book where publisher = 12345. If you do this, open the list of Publishers, open the "Wrox Press" instance and select the "Published Books" tab you should see the list of books like depicted in figure XWCIA.1. 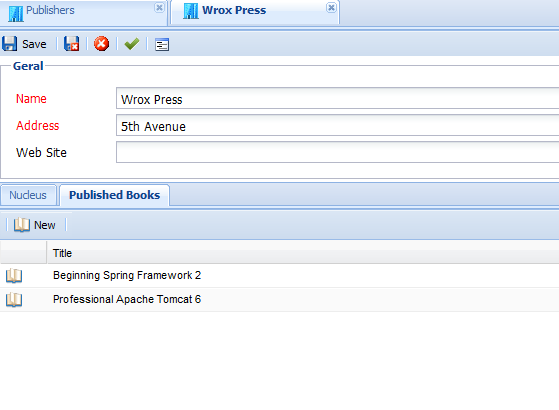 Figure XWCIA.1 - List of books published by "Wrox Press"
Also, a xeo:list component includes a default toolbar with the "New" button, which creates a new instance for that list. The problem here, again, is that the "New" button assumes the existence of a method that will perform that action and that method is available in the XEOBaseList bean (but it's not on the XEOEditBean). So, if anyone presses the "New" button on this viewer an error will be triggered; the solution to that will be either disabling the button, or implementing the method. Since there's not much sense in creating a book directly from the publisher's page, hiding the button seems a better choice and to do that use the renderToolBar property of the xeo:list component, which will hide the entire toolbar of the list. The following code is the final version for this viewer. As an exercise, do the same to the LIB_Author edit viewer (i.e. add a tab with all books that that author has ever published). You'll need to do exactly the same as in the publisher's viewer, but the XEOQL expression is a little different. Very often you'd like to make a custom render for a given column, instead of just presenting its value. The xvw:columnAttribute component which is used in gridPanels, list and bridges has precisely a property that lets you create your own custom render. For this example you'll take the list viewer of LIB_Book and change of state column so that instead of the state being the label "Available" / "Unavailable" it will display a small icon representing each state. The first step is creating a new Java bean, based on the XEOBaseList (to replace the one in the LIB_Book list viewer), name it LibBookListBean and make it extend the netgest.bo.xwc.xeo.beans.XEOBaseList bean (create it in the org.example.viewer.beans package). Open the LIB_Book list viewer and replace the beanClass property with org.example.viewer.beans.LibBookListBean. Next you'll need the icons representing the state of the book, you can use the two following icons ( ) and save them as "book_available.png" and "book_unavailable.png" in the webapps/default/Extras/Icons folder (you can use any other icon you'd like). The render method will return the value to be displayed on a given column (for each row), it returns a string which can be HTML code (allows you to display images, tables, or anything html provides). This method will be called once for every line in the corresponding gridPanel/list/bridge component for the given column where the renderer is being applied. The render method receives three parameters. The GridPanel (could be a List or Bridge component, because both extend from GridPanel) where the column attribute is placed, a DataRecordConnector instance and a DataFieldConnector instance. A DataRecordConnector is an interface representing a specific line in a list of elements. You used the DataListConnector interface before to display the list of books of a publisher; each of those books in a DataListConnector is represented by a DataRecordConnector. The DataFieldConnector is yet another interface which is tied to the DataListConnector and DataRecordConnector because it represents the value (and metadata) of a given column within a single line. If you recall from the LIB_Book Modeling phase, the state attribute was connected to a XEO Lov, which had two values, "0" for Available and "1" for Available. You'll only have to check what's the value of the state attribute and return an HTML string with the link to the image (as depicted in the previous code). Save the bean, launch the project and go the list of books, the result should now be like the one depicted in figure XWCIA.2, bellow. In the next chapter you'll learn how to create a more complex viewer, for the Movement Model.